Summary: Attend this webcast to discover how to use the latest version of ArtinSoft's Visual Basic Upgrade Companion (VBUC) to easily migrate applications developed in Microsoft Visual Basic 6 to both Microsoft Visual Basic .NET and C# using the Microsoft Visual Studio 2010 development system. 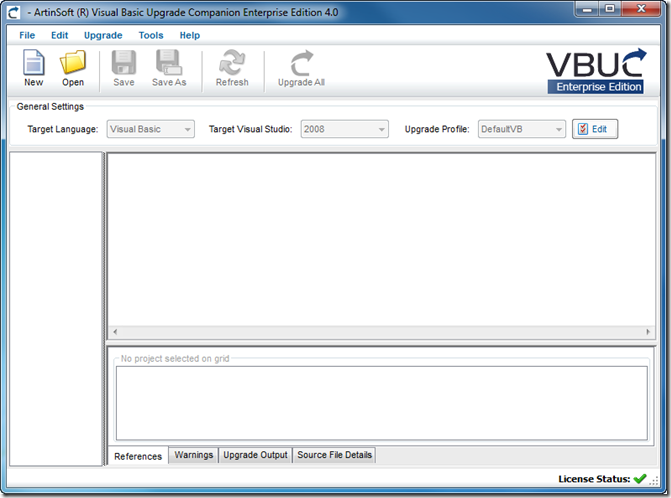 Now that the Upgrade Wizard no longer ships with Visual Studio, the VBUC provides a more powerful and flexible alternative to cost-effectively upgrade your applications to .NET, take advantage of the latest technology, and streamline your development process. One very common requirement for migration projects is to adapt certain error handling patterns used in a customer’s Visual Basic 6.0 code to the structured error handling provided by .NET, cleaning up the code, improving its maintainability, and, whenever possible, complying with .NET best practices. Const MethodName As String = "<NAME>"
(On Error Goto) could not be converted. Err.Number has a new behavior. This is just an example, but the intention is to show what type of customizations can be done. The VBUC transformation engine is very powerful, and, as long as a pattern can be identified, can help you automate the solution to most VB6.0 problems. We just posted a new case study about how an Italian company, Wolters Kluwer Italia, managed to successfully migrate its flagship Accounting and Financial services product from VB6.0 to Visual Basic .NET, using a customized version of the Visual Basic Upgrade Companion. This Wolters Kluwer is a case where the VBUC customizations performed by ArtinSoft helped them achieve two very important goals: first, to radically speed up the overall migration project, by having the VBUC do particular transformations that otherwise would have required manual changes, and second, to meet very specific requirements for the migration, such as using having the VBUC generate .NET code that used their own controls, do additional refactoring to the code, and other architectural customizations made possible by the VBUC engine. 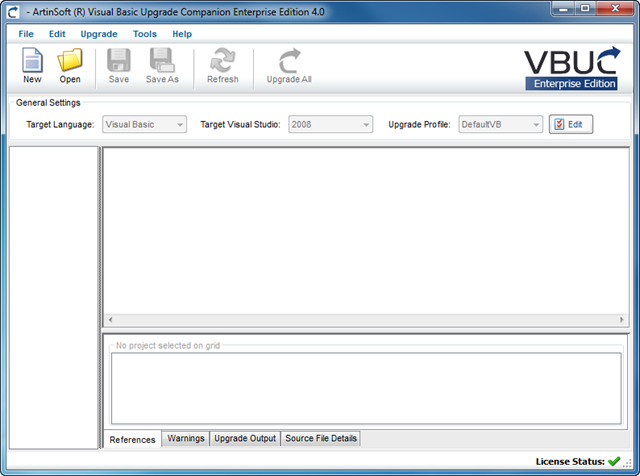 The first one is to download and run our new Visual Basic 6.0 and ASP Assessment Tool. This brand-new assessment tool considers both Shared and Duplicate files and counts both accordingly in separate columns. As shown in the screenshot below, the Assessment Tool identifies “Potential Duplicates”, which are files that have the same name and the same amount of effective (code + design) lines of code. In practice, they are normally the same file copied over several projects. You should note, however, that there may be small changes that keep the same amount of code (assignments, calls to different functions, etc), so there is no guarantee they are exactly the same. FYI, this was done to speed up the analysis process. In the future we will add additional heuristics to eliminate the possibility of false positives. This is a more exhaustive assessment than the one executed by the VB6.0/ASP Assessment Tool, and takes much longer to execute. This assessment will not create an HTML report (like the VB6.0/ASP Assessment Tool), but you can open the detailed line count report produced (Assessment_LOC_Report.xml) using MS Excel 2003 or higher. Project root: Make sure all projects are stored under a one “root” common directory. The VBUC migrates all Visual Basic 6.0 projects (*.vbp) found in a directory structure, including subdirectories, from one common root. You can read more information about setting up the folder structure in the VBUC Quick Start Guide. Third-party Components: The VBUC requires that all third party components are correctly registered. Also, very important, ensure you correctly install all licenses for the components. Not including these licenses will not allow the VBUC to load and identify the PMEs (Properties, Methods and Events) and correctly either apply the necessary maps or generate the corresponding COM Interop wrappers. Compile all projects: Make sure all projects compile correctly and that all the references between the output (EXE/DLL/OCX) of a project and the referenced component in another project match up. This will allow the VBUC pick up the references automatically, reducing the amount of migration warnings and thus minimize the work required to set up the migration solution. The VBUC Quick Start Guide contains additional details on the importance of this step.